Black Bear Lodge, located only steps from Silver Lake Village lifts and directly across the street from renowned Stein Eriksen Lodge, and is one of the few elite mid-mountain properties in prestigious Silver Lake Village in Upper Deer Valley. Enjoy rustic chic mountain decors combined with private hot tub on balcony when you are not on the slopes! Deer Valley was rated #1 ski resort in North America by Ski magazine for last 4 years. in a row. Park City Mountain Resort and The Canyons are also only minutes away for the snow boarders. Both Deer Valley ski lodges, Silver Lake Village and Snow Park offer complementary overnight ski storage . There are several boutique shops and ski rental and services also in Silver Lake Village. Historic Main Street offers over 40 unique restaurants, boutique shops, art galleries, the renowned Egyptian Theatre! Utah Olympic Park offers many opportunities to see Olympic athletes in training as well as the s Alf Elgin ski museum. So much to do! Wine Loft at Black Bear Lodge: Wine Loft is located on the top floor of Black Bear Lodge and has vaulted ceilings and full wall of windows as well as log walls and a river rock fireplace wall. It is one of only 7 penthouse condos in elegant Black Bear Lodge! Silver Lake Village has several award winning restaurants including the Forbes Magazine 2010 designated 'one of best restaurants in the world' Glitretind at Stein Eriksen Lodge with its 10,000+ wine cellar selection and The Mariposa, a #1 Zagat award winner and a Wine Spectator recommendation. Wine Loft provides the added touch to the wine connessior of a dedicated wine nook with a counter top wine cooler and wine accoutremnts and decorative accents. Winter in Park City: In addition to skiing and snow boarding, Park City activities include cross country skiing, snowmobiling, ice skating, Utah Olympic Park's Comet Bobsled and Quicksilver Alpine slide, hot air balloon rides, tubing, sled rides and MORE! And every January the world famous Sundance Film Festival! Summer in the City: Park City is truly a year round vacation place. Festivals, marathons, live music on Main Street and outdoor concerts several nights a week, film events, ATV and jeep rentals, golf, fishing, hunting, hay rides, horseback riding, sailing and even scuba diving in a nearby hot spring! AND the year round sport of shopping--at the boutiques on Main Street or the Tangers Outlets only minutes away! Mid-mountain location allows faster access to the lifts and avoid lines at the base. 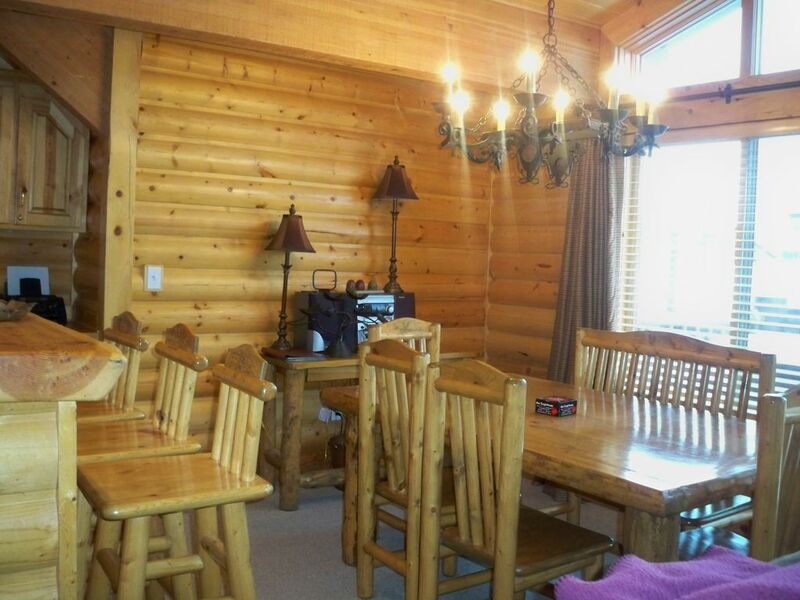 Great lodge eating options and facilities at exclusive Silver Lake Lodge. Silver Lake offers a variety of restaurants from the casual to some of the finest dining in Park City. Black Bear is across the street from the Silver Lake ticket windows and lifts. Silver Lake offers complimentary overnight ski storage. Hot wax and ski tune up is also available for a $10.00 charge. Very convenient to the lifts... 3 min short walk to where we checked our skis and boots each night for free at the Silver Lake Lodge. Condo was great and perfect for 2 kids and 2 adults we had. Early April spring skiing was incredible with great snow plus some bluebird days. Owner was great to work with and had no problem allowing us a late check out to get a few more hours on the slopes! Would stay here again! Richard and Cece Miles were spectacular. Renting directly from the owners of a property who obviously care for their property and for the guests. There were 3 other families that stayed at other units at Black Bear Lodge. The little things that Richard and Cece did and the communications were second to none. We have used VRBO for many vacations and this trip rates as one of the best. Thank you for the very nice review and we are delighted you had a fun ski getaway and enjoyed your stay at Wine Loft. Thanks Rob! Glad you enjoyed your stay! All the best for rest of 2019! This is our third year staying at Wine Loft/Cave and we love it!!! Both places are clean, well stocked and comfortable. Walk to the slopes (in ski boots) is about 5 minutes. With our family of six, we fit comfortably in the Wine Loft. The Miles' are really great and easy to work with which is one of the reasons we keep coming back. Overall great value. We can highly recommend the Wine Loft/Cave and the Miles'!!! Our family loved the Wine Loft! It was clean, comfortable and perfect for our family's spring break ski trip. We used the hot tub every day and our kids loved the loft, with foosball table. It was close and convenient to the mid-mountain ski lift and a short drive to Deer Valley base and Main Street, Park City. We would absolutely stay here again! Gold standard at Silver Lake! Black Bear Lodge is located in Upper Deer Valley, mid-mountain, in the elite Silver Lake Village area. Deer Valley, rated #1 ski resort in North America by Ski magazine 5 years in a row, is one of three ski resorts in Park City. Park City Mountain Resort, rated #8 overall, and The Canyons, which offers a constantly growing variety of summer activities are both only minutes drive. AND is only 35 miles from Salt Lake City International airport making it one of the most accessible ski areas in the world! Park City is also home to Utah's 2002 Olympic Park which offers a Winter Olympic museum, guided tours and ski competition demonstrations throughout the year by both Olympic medal winners and hopefuls as the park is primary training facility for winter sport athletes from around the world. Main Street, heart of this historic silver mining town, is lined with quirky art galleries, boutiques and all unique restaurants! Winter and summer sports of all sorts! $325-$995/nt US Dollars All rentals subject to applicable taxes--Utah Sales Tax 7.95% plus Local Transient Tax 3.0% Total Tax 10.45%. Departure cleaning fee $200 Mid-stay or daily housekeeping available for additional charge.